HOW WILL MY BABY BE HAPPIER With Beaming Baby Bio-Degradable Diapers? By only using Certified Organic Plant Ingredients in the Lotion on these, the USA's Best Selling Organic Baby Wipes, Your Baby will avoid the Harmful Herbicide and Insecticide residues found in standard wipes. By Stripping Out Parabens, Alcohol, Detergents and Chlorine which are often found in other wipes, your baby will avoid these potential health hazards. 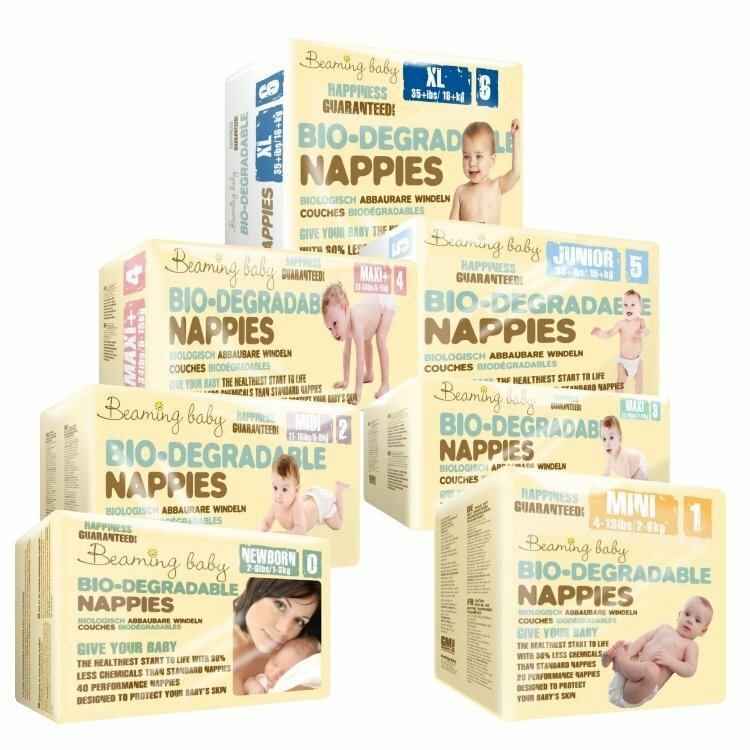 Our 100% Bio-Degradable cloth material is made from TOTALLY GM FREE Sustainably Grown Trees, helping to give your baby the HEALTHIEST start to life. YOUR HAPPINESS GUARANTEED with Beaming Baby Bio-Degradable Diapers and Organic Baby Wipes! Mini Size 1 Subscribe and Save Bundle - Save $23.20, 31% OFF! Midi Size 2 Subscribe and Save Bundle - Save $27.06, 34% OFF! Maxi Size 3 Subscribe and Save Bundle - Save $27.06, 34% OFF! Maxi Plus Size 4 Subscribe and Save Bundle - Save $27.06, 33% OFF! Junior Size 5 Subscribe and Save Bundle - Save $27.06, 33% OFF! XL Size 6 Subscribe and Save Bundle - Save $33.56, 35% OFF!